Our ugly master bathroom has been long overdue for a makeover, so we tackled it in the One Room Challenge! Renovating the shower was easier than we thought, thanks to some great materials and tools. 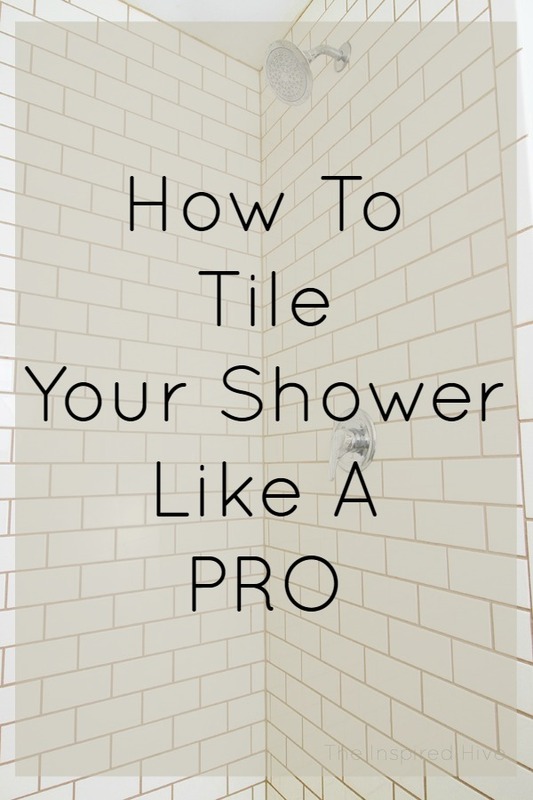 Yesterday, I shared the best option for waterproofing your shower, and today I am sharing how to install the new tile! Never tiled before? Don't be scared! If we can do this, you definitely can!!! Once you find your groove, it goes fairly quickly! 1. Install tile backer board. See my tutorial on installing PROVA BOARD PLUS+. 2. Gather your supplies. M-D Building Products carries this great little tile bucket kit that carries everything you need for this project! You know I am all about making things quick and easy, and this kit does just that! 2. 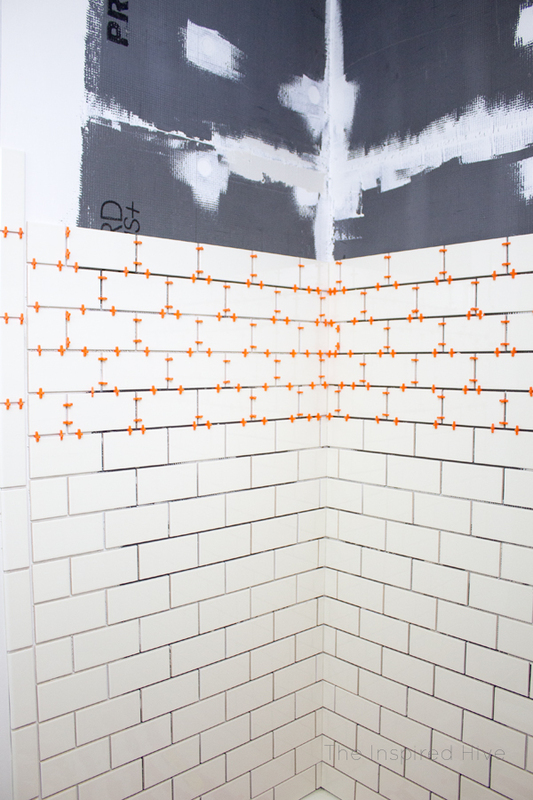 Lay out the first two rows of tile on the floor how you envision it on the wall. Play around with different patterns. Do you want the tiles off set or all aligned? Laying the tiles out also allows you to envision where your cuts will fall and how large they will be (you don't want to end up with a teeny tiny impossible cut on one side!). 3. 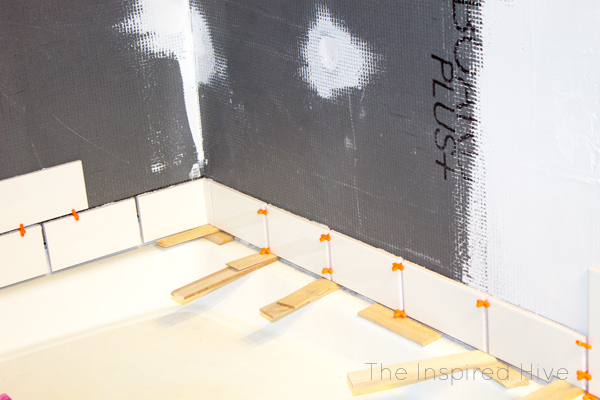 Use a large level to draw a line for the top edge of your first row of tile. 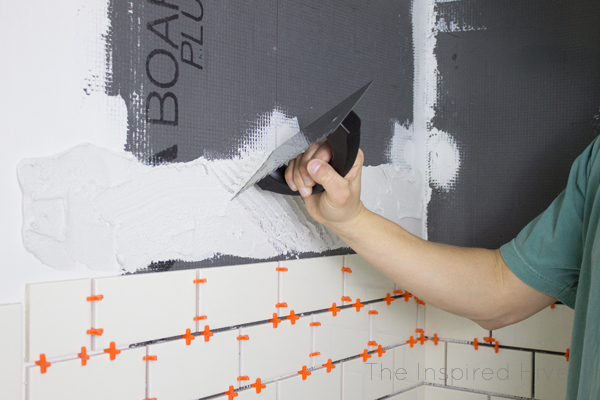 Starting with the bottom row of tile, apply thinset mortar to the wall using a notched trowel. Use the trowel to make diagonal stripes in the thinset. Drag it across the thinset in sections across the wall. The bottom row of tile is the most important. If your first row is perfectly level, the rest should be level as well and you can just check as you go. It's important to let the first row cure before moving on because this will prevent the rest of the rows from shifting since they will be sitting above a solid base. Follow the instructions on your thinset for cure time. 4. Measure the center of the wall and draw a line from floor to ceiling. Starting at the center, place a tile onto the thinset. Use shims if needed (our shower pan wasn't perfectly level, so we adjusted using wooden shims). 5. 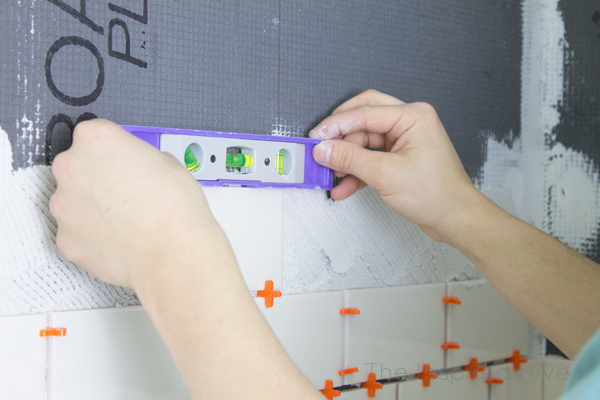 Place spacers in between tiles. Check for levelness of each tile using a small level. Check levelness of the whole row with the large level after you've done several tiles. This may seem like overkill, but trust me, you don't want to run into issues with levelness once you get to the top of the shower and don't have enough space left for adjustments! Save the corner pieces for last. 6. When you get to the corner piece, measure your space. If your walls aren't perfectly plumb (like ours), it's best to measure the cuts for each and every row rather than assuming they will all be exactly the same. 7. Now that you've finished the first row, sit back and relax for a few days and let it set. (Again, follow the cure time on your thinset). 8. Once the first row has set, move on to the next row. You have a couple of options for how to tackle the rest. If you are like us and have a little one running around, you're probably working a little at a time during naptime or at night. Because of this, we worked in sections of about 4-5 rows at a time allowing at least 24 hours of cure time in between sections. If you have the time, you could also just work continuously on one whole wall before moving on to the next wall. 9. Again, apply thinset to the wall using a trowel. Only apply as much as you need for the size of the section you are doing. It starts to dry fairly quickly, so you don't want to apply it to the whole wall at one time. 10. 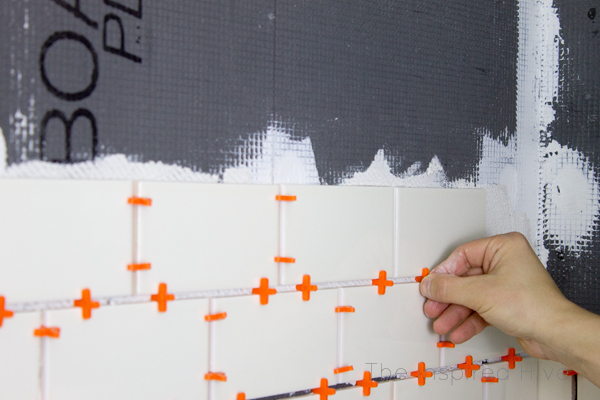 Apply a section of tile using spacers in between to keep things accurately aligned and check for levelness as you go. The spacers should keep things pretty level, but again, if your walls or shower pan aren't quite level, you may run into issues. We used 3/16" spacers. This is totally preference. Typically smaller tiles = smaller spacers and larger tiles = larger spacers, but I love the look of thick grout lines with subway tile, so we went with the 3/16" spacers. 11. When you arrive at the level of the shower faucet, we scored the tile front and back and then used tile nippers to make cuts. 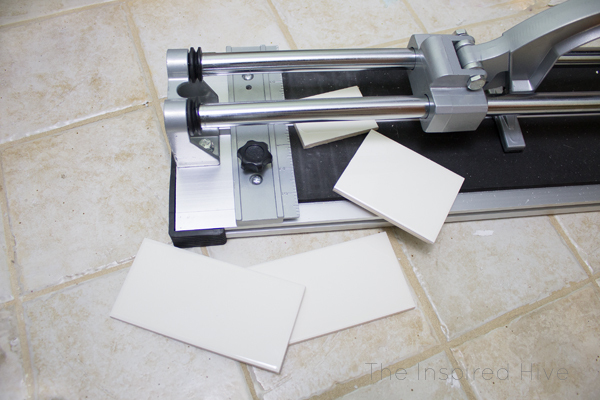 Working slowly is key with the nippers so that you don't crack your tile! 1. Choose your grout. We chose to use premixed grout to save time and make our lives easier! Polyblends grout carries many colors. We chose a taupe color that would blend well with our existing floor tiles. We learned that because we were using 3/16" spacers, we should use sanded grout. Anything over a 1/8" grout-line requires sanded grout, and anything smaller can use unsanded. 2. 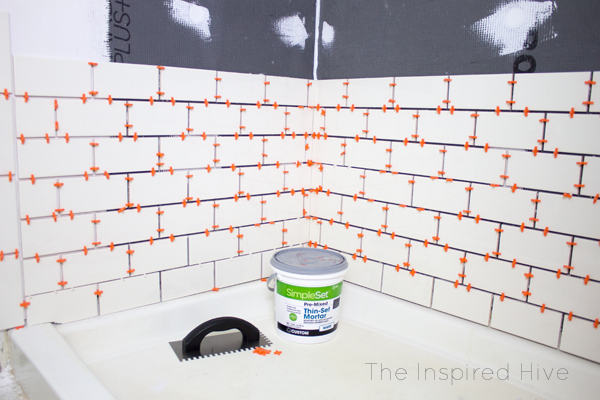 Pack the grout into the tile joints using a grout float. Apply it in a "V" shaped motion, diagonally to the left, then diagonally to the right. 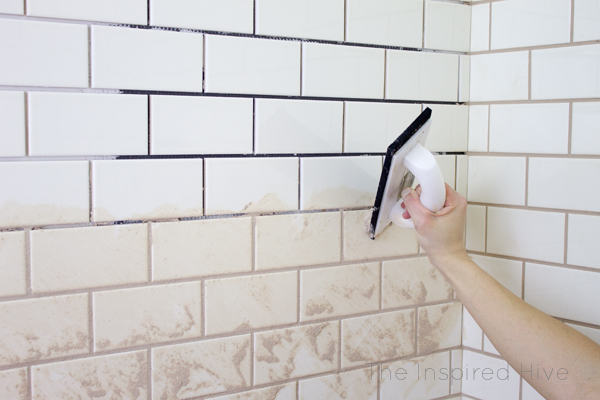 Scrape off extra grout with the float as you go. 3. 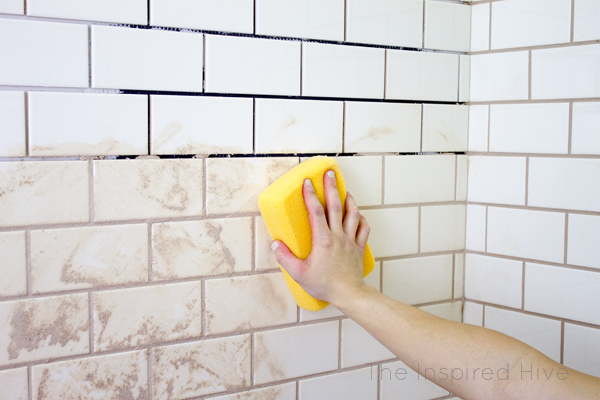 Use a damp grout sponge to wipe off the excess grout from the face of the tiles. We quickly learned that you should wring out as much water as possible from the sponge before wiping. It should be just barely damp. 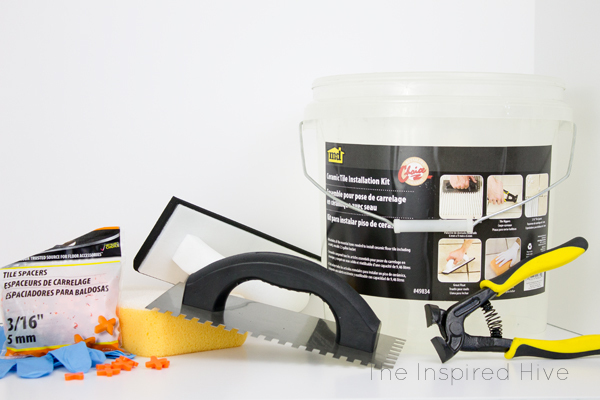 Fill your bucket with water and rinse the grout from the sponge in it frequently. You may also need to change the water in your bucket frequently, as it gets cloudy quickly. We found that changing the water helped reduce the amount of haze on the tile. 4. Follow the directions on your particular grout for removing the haze from the tiles. Ours recommended waiting a minimum of four hours and no more than 24 hours. It will slowly harden and become more difficult to remove, so I recommend aiming for four hours. If you go past 24 hours, you will likely need a specialized cleaner to assist in removal. Use a soft, damp towel to wipe the haze away. 5. Once the haze is removed, let the grout completely cure for 24 hours before applying caulk. You can purchase caulk in a matching color, and Polyblends carries a sanded grout too. 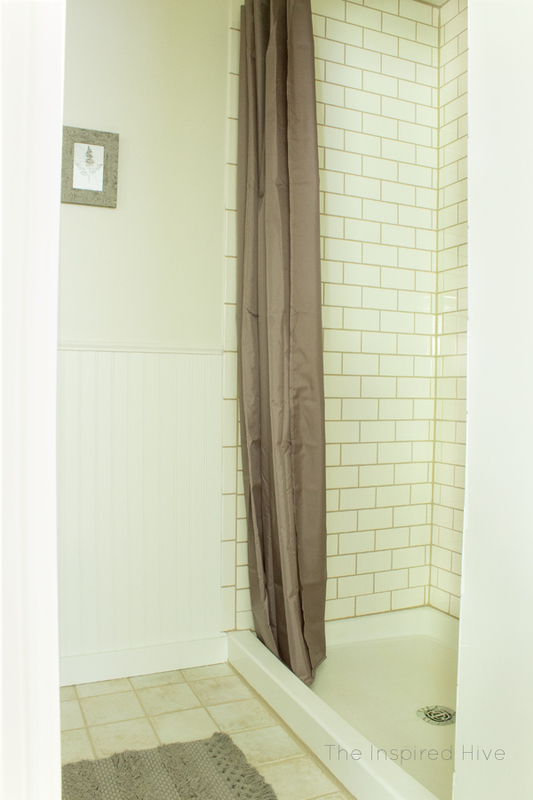 We caulked along the corners of the shower, the ceiling, and the shower pan. 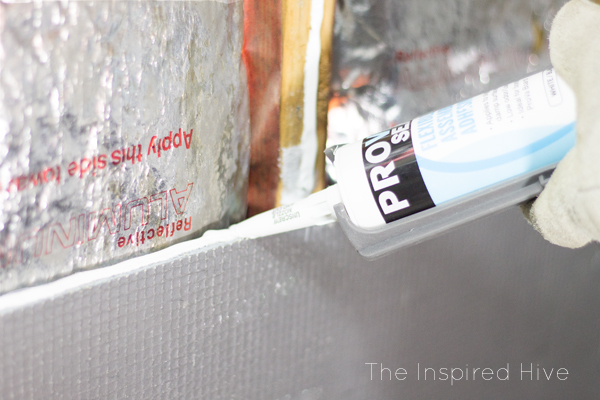 Use your finger or a caulk tool to smooth the caulk. Sanded caulk takes a long time to dry, so be careful not to bump it all! 6. Install your shower faucet and shower head, and admire your new pretty shower!! !